The Veloth Clan is a family of Dark Elves that live in the province of Morrowind. The Veloth clan has a long and prominent history on the region of Vvardenfell, and is said to be the lineage of the prophet, Veloth the Pilgrim. The Veloth Ancestral Tomb is found in the West Gash of Vvardenfell. Their house affiliation is unknown. 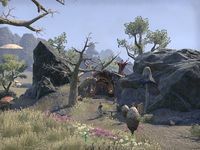 The Veloth Clan claim to be the descendants of Veloth the Pilgrim, the former noble of the Summerset Isles, who guided the Chimer to the promised lands of Resdayn in the late Merethic Era. Like other families, the Veloth Clan was ruled by a Patriarch/Matriarch. One of the earliest members was Llirala Veloth, who was the Matriarch for more than one hundred years. She was known for beauty, and brough peace and prosperity through three marriages. The Tribunal had graced her with everlasting beauty, leaving a positive impact on the Veloth family. Another was Ondre Veloth, known as the Master Archer of Molag Amur. He was given a mighty bow from Almalexia. He had defended the pass near Lake Nabia for nine days, until he was taken down by the Sload. One fateful day, a member of the Veloth Clan was killed. His daughter, Valyne Veloth, would seek out revenge for the rest of her life. As time went on, Valyne had infiltrated their ranks and was soon to marry the same person that killed her father. She had secretly poisoned the killer and his entourage, kill everyone and herself in the process.. Elms Veloth was a member of the Veloth family during the Year of Great Hunger, feeding both family and retainers of the clan. He would not accept food for himself, and so because of this, the Veloth Clan survived but Elms would pass away in hunger. The Veloth family had lived as far as 3E 427. For game-specific information on the Ancestral Tombs, see the Morrowind and Online articles. Honored Ancestors — Poems about famous Veloth family members. This page was last modified on 7 March 2019, at 20:05.